This article was contributed by Beth Geiger. Beth will complete her BA in Geography and Environmental Studies BA at the University of Alaska Southeast in May. She grew up in Southeast Alaska, which gave her a strong appreciation of the environment. After graduating, her next stop is New Zealand, where she wants to spend most of my time in the out of doors – instead of the classroom – for a few months. Beth shared with us that ecomedia is a powerful tool that can be used to inform or manipulate, and after taking an Environmental Film class from Professor Sarah Jacquette Ray as part of her undergraduate studies, Beth hopes to incorporate ecomedia studies into graduate school in a year or so. 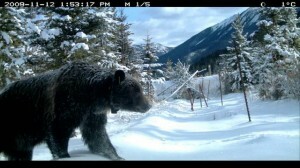 Bear 71 is an interactive, “new media” documentary that intertwines the life of a female grizzly bear living in Banff National Park with other park wildlife, all using surveillance footage from the remote cameras within Banff. Leann Allison and Jeremy Mendes created the twenty-minute documentary, with a powerful narration written by J.B. MacKinnon and read by Mia Kirshner. It is hosted on the National Film Board of Canada’s website with free access. Through the film’s interactive delivery viewers are forced to confront the technological observation of nature – is this a positive tool used to understand other beings, or is this an invasion that further detaches us from the rest of the plant’s inhabitants? The film experience is for the most part driven by the user, who chooses where to go and what film clips to watch – this means that individual users may have very different experiences. Different points in the digital Banff have different facts about animals living in the park or what sets that place in the park apart. Additionally, if the computer used for viewing is hooked up to a web camera the user appears wherever they go, and upon switching views, all current viewers are shown in a “surveillance wall”, adding to the surveillance feel of the documentary. Not only are the animals in the wild being watched – so are the people sitting at their computers. There are four film segments that pop up during the exploration for all users to watch where the female Bear 71, as she is known due to her tag number, narrates over footage of her life. This begins with the footage of her being snared, tranquilized, and tagged as a young adult bear. She explains what drug she is tranquilized with as the film shows her being visibly frightened as wildlife rangers scare her away with flares after tagging. The narration continues over the user’s exploration while Bear 71 explains the changes happening in her valley. The park now has human smells, roads, railways, and is rigged with surveillance cameras, wire to collect hair samples, and the only way for wildlife to cross the highway that divides the park are a collection of over and underpasses. She points out that these days “it’s hard to say where the wired world ends and the wild one begins.” She also mentions that there are no ways to safely cross the railway, and that year each railcars filled with grain leak the equivalent of 300,000 loaves of bread – it’s a smell that is impossible to ignore. Throughout the narration she also points out what she was taught by another bear: that the first rule of survival in this modern age is “don’t do what comes naturally.” Eventually, forgetting this rule is what ends the life of Bear 71 – she and her cubs emerge from hibernation and the next day the starving bears head to the rails to look for grain. She says the train took her by surprise, and she had cubs to defend so she did what came naturally, she roared and charged. Upon this new information the user realizes that this has all been a postmortem narration and this is how the bear knew things like what she was originally tranquilized with and what Google is. Filmmaker Leann Allison has suggested that the postmortem narrative gave the creators a freedom that they would not have had otherwise. Instead of being restrained by anthropomorphizing a living creature, the postmortem Bear 71 can prod the viewer towards an analytical look at technology and surveillance in the modern world without the same argument flaws that come with characters like Smokey the Bear. Bear 71’s surviving cub is tracked down, tagged Bear 107 and given a relatively low chance of survival due to her age. The film certainly has points that are aimed at emotions instead of intellectual reflection, however these points are part of the overall story. Bear 71 steers clear of the dramatic red herrings of other animal documentaries, such as The Cove. There are mother bears and cubs, but we are being presented with a story, that while probably somewhat dramatized, it is not an over the top account of the bears while disregarding the other creatures inhabiting the area. Bear 71 also makes no effort to cram an opinion down the viewer’s throats – it is a presentation of information that the viewer must make their own decision about what it means to them. The documentary raises questions about the surveillance of animals, and humans, as well as technology’s role in our modern world. As Bear 71 points out, surveillance is there partly to protect you, and partly to protect everyone else from you. As someone who grew up with a parent who worked for the Alaska Department of Fish and Game for close to thirty years, the concept of tagging and surveying animals was nothing new to me. In fact, prior to this film I felt like these were positives – we are learning more about these animals to keep them and ourselves safe. But where do we cross the line? Banff National Park is supposed to be an area for nature – are there even any places left that we can consider this way? Randall Telichi, who worked with filmmaker Leanne Allison on her film Being Caribou spoke of the technological web we are weaving around the world and how we are so close to blanketing the entire planet. Are these positive advancements, or unnecessary intrusions? These are the sorts of questions that Bear 71 raises but purposely does not answer. It is the job of the viewer to decide what is right and where the lines fall. As with other films that use this method of a presentation of information and images without a stated intention – such as Manufactured Landscapes – I think Bear 71 succeeds at pushing the users to think critically about our modern use of technology. Is monitoring nature connecting us to it, or is it just another disconnect? When I first saw all the roads and listened to Bear 71 describe the smells and dangers in her home I found myself not thinking far enough and wanting the unnatural removed from the home of these animals. “Someone get rid of these roads and trains and let the animals live there!” Quickly I caught myself, and decided that thinking along those lines is impractical and lacking any sort of depth. “Okay, well maybe that’s not the solution, so what is?” I went forward thinking during the film and reflecting for hours (and now days and weeks) after about what the right answer is in this situation. Is this just the consequence of not being the animal at the top of the food chain? Should we completely remove ourselves from these areas that have been designated for wildlife use? Does that even make sense that humans are labeling spaces “wildlife areas”, especially considering how far these animals roam when undisturbed? Are we protecting the masses by interconnecting and constantly watching everyone and everything? These are the questions that my generation needs to be addressing in the coming years. Where are the lines with wildlife, surveillance, and technology? Right now these are questions I cannot answer, but I hope to move towards answers and solutions in my lifetime. Bear 71. Dir. Leanne Allison and Jeremy Mendes. Perf. Mia Kirshner. N.p., n.d. Web. 23 Nov. 2012. <http://bear71.nfb.ca /#/bear71>. “Bear 71.” Wikipedia. Wikimedia Foundation, n.d. Web. 23 Nov. 2012. <http://en.wikipedia.org/wiki/Bear_71>. “For Your Consideration: Bear 71.” For Your Consideration: Bear 71. Unknown, n.d. Web. 14 Dec. 2012. <http://foryourconsideration.ca/bear71/>. Geiger, Beth. “Lunch with Leanne Allison.” UAS, Juneau. 14 Nov. 2012. Address. Geiger, Beth. “Lunch with Randall Tilichi.” UAS, Juneau. 7 Nov. 2012. Address.